Following the conversation on here back in September, I ordered a Fat Penguin Stove and we've now got it installed. It's a really beautiful extremely well made stove and it is incredibly easy to get in and keep in. So impressed are we, that despite having just had the front room stove redone (i.e. the chimney lined and the existing stove re-installed), that we are seriously considering replacing it next year with one of the Fat Penguin's siblings probably the Short Penguin. 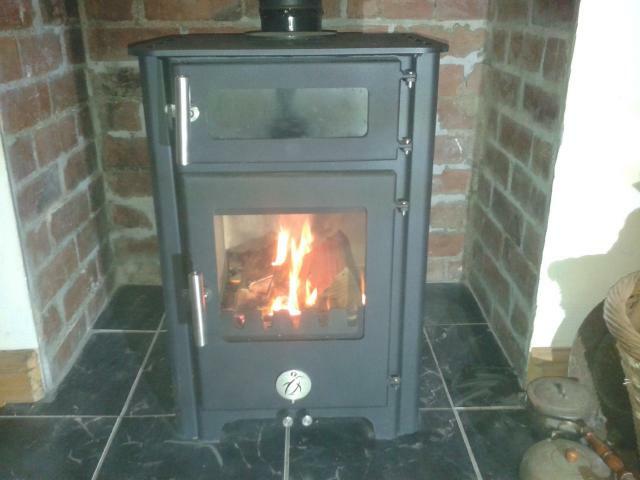 They certainly aren't the cheapest stoves on the market but they are really good ones and come highly recommended! I did not appreciate how much difference a good stove makes until I had a couple of shoddy ones. Our first one was a Charnwood and it was awesome. Piece of cake to light and keep in all night, easy to empty. Since then I've had a stove that is so small you can't get a log in it, and whose door did not open to even 90 degrees. One so big it just drew like mad and roasted us all and ate wood like it was inexhaustible. One that was incredibly fussy about being lit and none that will stay in all night. The current model doesn't have any sort of ash pan, so you have to shovel all the ash out. I really, really miss the Charnwood. They do look nice. I'm happy with our Clearview though, so unless we move house or inherit an unexpected fortune and can afford to sort out the back chimney I'm not really in the market. Me either. What's the door at the top for? I wondered if it was. What a good idea. I ordered a Fat Penguin Stove and we've now got it installed. It's a really beautiful extremely well made stove and it is incredibly easy to get in and keep in. Phew I am glad you liked it. Been recommending them for a while. Sadly when we bought our Littlewenlock we dint know about our neighbour. We have a Clearview too and we are quite happy with that. When we bought it, it was about the best available, and must say it has lasted well. We use a little bit of coal to keep it in over night, but a couple of large logs will also do the trick. We have a flat topped one so it can be used for cooking, and Dave Cook, who I think was on here at one time uses his for baking by raking the embers into the ash pan and putting bread in the fire itself. I know what you mean about stove size WW. We get some customers who can't take more than 8" logs, sometimes not very chunky ones, and they are the bane of our life as firewood suppliers, and must burn wood like there is no tomorrow. Our Clearview has the ridged top. It's the only mistake we made when buying it. There's too little room for many chestnuts.